Compare Maps and follow Links to more Information and Photo's ! 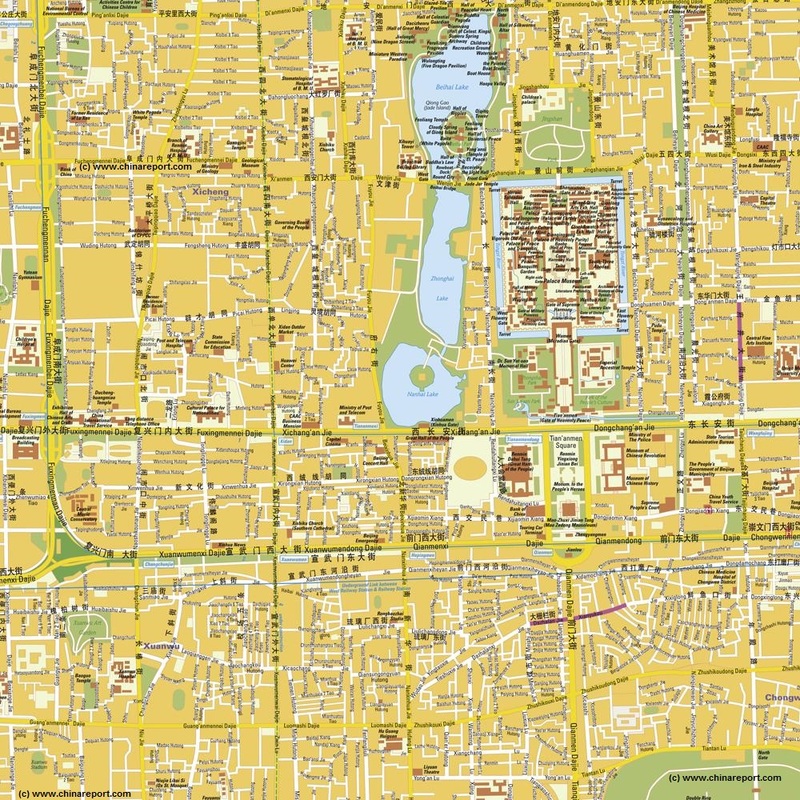 This Partial Map of Central Beijing combines the Square of Heavenly Peace, the Palace Museum (Forbidden City) and parts of the surrounding districts of Xicheng, Dongcheng, Chongwen and Xuanwu into one Map. All major boulevards, streets and side-streets are depicted. Major landmarks, historic monuments, former residences of Beijing Celebrities, Museums, Parks and other sites of interest within each area are marked on the map with a link to further information. Map roughly covers the area between Fuchengmen Dajie in the west (2nd Ring Road), the northern gates of Beihai (North Lake) Park in the North, the eastern end of the large Oriental Plaza Mall(s) in the east and the TianQiao Theaters (on the border between the Xuanwu- and Chongwen Districts) in the south. Main Landmarks are marked on yellow background ( ), former residence (museums) in cream color ( ), stores of interest in pink ( ) and various other help points and facilities in light green ( ). 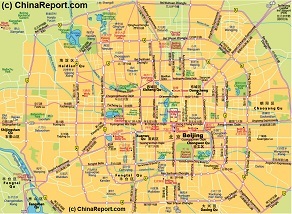 Overview Map of the Central City of Beijing as well as the first ring of Inner Suburbs. Mouse over Map to discover varrious area's, click and follow the links to additional maps, information and photo's. For completeness, Link options to two additional overview maps of roughly the same area are provided underneath this map.